Among all of the English verbs, “make” (construct; create) is one that most speakers learn rather early in their lessons. 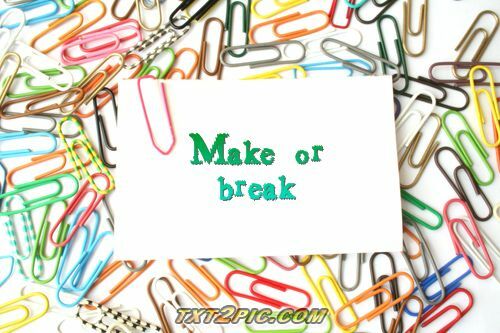 Another simple verb is “break” (bust; become inoperative). Put them together and you have a popular idiom: make or break. The verb to “make or break” (something or someone) is to cause either total success or total failure. There is no middle ground between these two extremes. Used as an adjective, a make-or-break situation will bring great success or complete failure. - Danny’s “make-or-break” speech will determine whether he passes or fails his English course. - A review from the New York Times restaurant critic can “make or break” a restaurant’s business. - Introduction to Criminal Law is a "make-or-break" course for all freshman law students at the university. Have you ever experienced a make or break situation?